C’mon, 1st Grade boys and girls! It’s your favorite time again! GROSS OUT YOUR ART TEACHER! Join me this year in trying to fill one card per class! 1st Grade art class has never been this fun before! *To “grab a card”, simply click on the image to view it, and then right click on the image and save it to your computer. You can then edit it in any photo editing program to add your own tokens. Can I play along and use the boys instead? 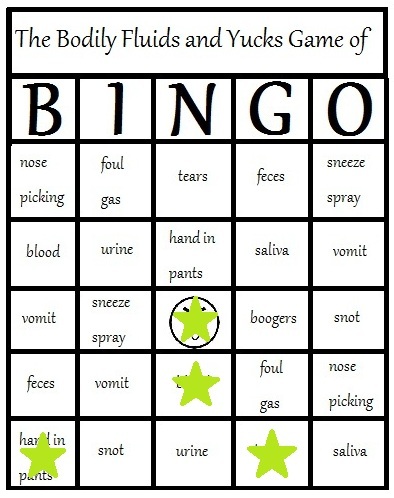 Pretty sure I could get all of these spaces filled in one day if I can get B laughing hard enough to induce vomiting. 😉 JK. I had first graders yesterday and I would get a star on hands in the pants, vomit, boogers and tears but I still love those first graders. I will share your awesome game with all caretakers & teachers I can think of. 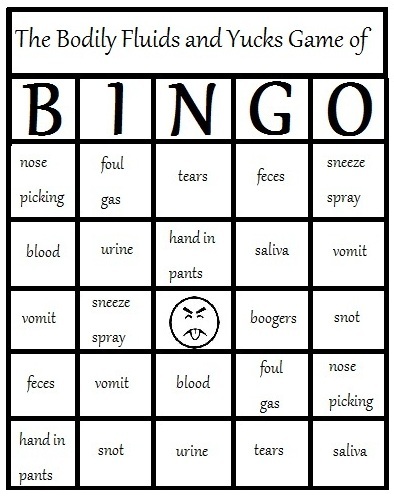 As long as we don't focus on how quickly any of us get BINGO it's fun! I could cross off the urine (kindergartener peed his pants), tears, blood (paper cut and bloody nose), snot from sneezing, booger, and lots of foul farts… gotta love Elementary kids. That was in ONE week! I teach Middle School and I full-out had a conversation with a 6th grader today WHILE his/her finger was up in the nose to the second joint. eeewwww. Oh, lordy, a game you never want to win. I have never had feces in my classroom yet. Well, at least not out in the open, I am sure it was in some of their pants. baaahaaaa! I had slavia and tears this morning before 9:15 with one of my kindergarten students. Worst part was it was not me that coused it, it was something he got in trouble for in the hall on the way to my class! And to make it even better he howled at the top of his lungs for the first half of the class, until I threatened to call the principal down to come and get him for disrupting my class—UGH!! !